an A/C installation from Foust Heat & Air! Contact Foust Heat & Air Today! At Foust Heat & Air, we take a great deal of pride in our reputation for exceptional service, but we don’t rely on past history. As a Bryant Factory Authorized Dealer, we not only remain current with leading-edge technology, we continually strive to improve our customer service. We are held to strict standards for technician skill, service, and business practices. Contact us at (209) 591-5065 for convenient scheduling, punctual arrival, damage-free job sites, and quick turnaround on all projects. We provide a wide range of HVAC services, including free estimates, and 24/7 Emergency Repair throughout Columbia, Sonora, Jamestown, Twain Harte & Groveland, CA. At every opportunity, we optimize the energy efficiency, reliability, and longevity of your essential heating and cooling equipment, saving you both time and money. Let us perfect your indoor comfort, and we’ll get the job done right the first time. Call Foust Heat & Air for all your heating and cooling needs throughout Sonora, CA and Surrounding Areas! 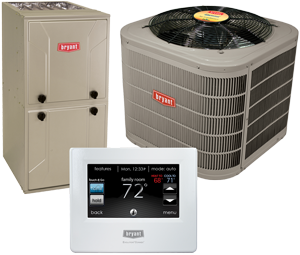 Whether you’re in need of new system installation, replacement, seasonal maintenance, or prompt repair, a call to Foust Heat & Air is answered by a highly skilled professional. We prioritize the training of our team. Our technicians receive extensive education and regular updates, staying ahead of industry advancement, evolving technology, and recommended procedures. We match your specific requirements to the right products and services for greater return from your investment. Foust Heat & Air is synonymous for Quality You Can Trust.